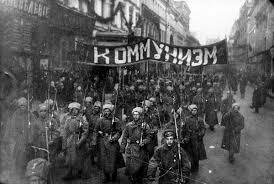 The extremely progressive move in Russia toward communism mirrored reactionary efforts in Germany after WWI. Where Russia bounded ahead with modernist ideas, the rise of fascists in Germany and its satellites represented a reactionary tendency. An underlying motive behind both movements was nationalism, but the political expression of it sparked another World War. The new regimes used music to back up their ideologies, often against the composers’ wills. For all his innovative work on refining a Finnish sound, the political sphere at large abused Sibelius’ affinity for the old-fashioned by making him out to be a symbol of extreme conservatism. While he did detest modernism and the the governments that embraced it (Soviet Russia), he was no Nazi. Even so, the Nazi’s used him and his music as a symbol of their extreme ideology. The Nazis also embraced the music of Richard Wagner, a giant in the early 19th century German classical sphere, who share a triumphant and stately character with much of Sibelius’ music. Despite being acknowledged as one of the greats, Wagner’s music still faces a very unfortunate taboo due to its connection with the evil regime. Russia’s extreme switch in ruling ideologies dealt with its rich musical history is a way that is as uniquely Russian as the Tsar himself. Russian music dating from the Napoleonic Era characterized two disparate kinds of nationalism, one of immense pride and one of equal hatred. Such is the case with Pyotr Ilyich Tchaikovsky’s “1812 Overture,” written in commemoration of the Russian victory near Borodino over the invading French army. The piece includes a phrase from the French national anthem as a boastful mockery, as it is almost immediately followed by cannon fire. The influence of Russian Orthodox as the religion of the nation enters in the form of a quote from an old hymn. The Russian people had immense pride in the Tsar during the first half of the 19th century, Tchaikovsky himself greatly benefiting from the patronage of the Russian ruling class. Toward the end of Tchaikovsky’s life, Tsar Aleksandr III awarded him a lifetime pension for his immense contribution to Russian music in 1888. But the station of the Russian constituency lagged behind the rest of Europe, the ruling style and organization of the peasantry becoming increasingly antiquated in a world of technological and political innovation. The failure to modernize certain industries in Russia exacerbated famines and led to bourgeois dissatisfaction which targeted the Tsar. Tchaikovsky’s boisterous and victorious music, which even quotes from the pre-soviet national anthem, became a symbol of the Russian Revolution and outing the Tsar in 1917, where just over a century before it proclaimed the eternal preservation of the monarchy. The working-class and military constituency detested the luxury and privilege of an outdated monarchy, hence the appeal of communism and Soviet rule. The Soviets used the music as a symbol of nationalism framed against the old regime and aristocracy, cutting out and replacing the parts of the overture that praised the Tsar. The music itself–style unmistakably Russian–still spoke to the citizens and leaders who merely wanted the best for their countrymen. One of those countrymen seemed to not express extensive affinity for his country despite drawing heavily on its traditions. Igor Stravinsky’s life and music can be considered in two parts punctuated by WWI which caused him to leave Russia. In his early career, he trained under Nikolai Rimsky-Korsakov, one of the “Mighty Five” Russian romantics who dominated the musical scene in Russia in the 19th century. Through is association with them and the national ballet, many scholars have unabashedly identified Stravinsky’s early work as an expression of the traditional Russian nationalism that his teacher embraced. “Rite of Spring,” one of his famous ballets, is based on a pagan Russian tradition. In an article by Jens and Benedikte Brincker, the argument is made based on the work of Stravinsky’s biographer Richard Taruskin that Stravinsky’s music may actually have basis in Turanian (Turkish) nationalism in Russia. While he was at least indirectly associated with the fascist ideology embraced by Turanians, the Brinckers cannot conclude that Stravinsky explicitly constructed his music from this instinct, especially given the unmistakably international character of his music and lifestyle after 1920. He moved to France, then settled in the U.S. due to WWII and became a naturalized U.S. citizen. In light of the composer Béla Bartók’s use of Hungarian gypsy music in what he refers to as modern international music, Stravinsky’s influence by the Russian giants seems almost immaterial next to his affinity for musical innovation and association with the dry, technical twelve-tone music of Arnold Schoenberg. He did eventually return to Russia late in his life, but only for touring purposes. This view cements Stravinsky as the bridge between the Romanticism that took flight in the 19th century and the extremist regimes of post-WWI Europe and a new modernism embraced as a reaction to it. The Changing Character of Russian Nationalism in Music by Christopher is licensed under a Creative Commons Attribution-ShareAlike 4.0 International License. Exploring the familial impact of cold case homicidesYou don't have to be Finnish to be a Finnish nationalist.